Engendering good procurement practices in Liberia’s Public Financial Management System is no doubt achieving its objectives evidenced by the capacity building mechanisms employed by the Public Procurement and Concessions Commission (PPCC), to enhance the ability of private sector businesses in promoting the economic development of Liberia through fostering competition in the Public Procurement Process. This laudable initiative, no doubt, rests on the shoulders of the farsighted, innovative, and pragmatic Executive Director, Peggy Varfley Meres, and a team of professionals who have committed their professional lives to the implementation of the mandate of the Commission. These assertions, which come as true representation of a charismatic leader, were further demonstrated by Madam Meres when she delivered a captivating statement at the opening of a three day procurement training workshop for private sector businesses in the procurement of goods, works, and service, as well as the complaints, appeals and review process. In a spirited speech delivered on the fateful morning of Tuesday, June 25, 2013 at the Monrovia City Hall, Madam Meres opined that the economic development of any capitalist country rests heavily on the private sector, which unfortunately in the case of Liberia, is fragile with a great need for building of capacity, in order to explore and harness available resources. The Commission, in executing its mandate, Madam Meres disclosed, has observed on many instances low responsiveness in the bidding process and failure to satisfy minimum requirements which are usually due to minute, but very significant omissions. For these and other reasons, she further disclosed, many qualified local businesses fail to obtain government contracts which could have impacted the overall economy of Liberia. “Millions of dollars leave the shores of Liberia for investment in foreign lands, when we have local talents which if developed could have captured these leakages for reinvestment purposes, to further stimulate the economy,” Madam Meres noted. 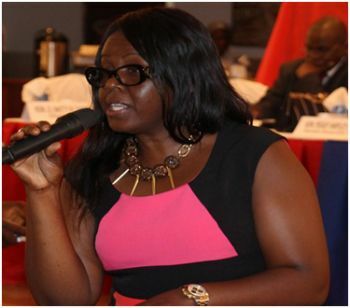 Madam Meres reassured private sector businesses of the PPCC’s commitment to creating a level playing field and engendering a framework that would permit all actors in public procurement to bid for government contracts consistent with the PPC Act. “Today, we are witnessing the inception of a renewed partnership with the private sector, in ensuring adequate and increased responses to Invitations for Bid, the delivery of high quality goods, works and services, and overall obtaining maximum value for government’s limited resources. It is our earnest hope that you will find knowledge gained from this initiative very productive and impactful on the work that you do, and that it will increase your chances of obtaining contracts through the public procurement process with fairness and transparency,” she concluded.